Director Tony Maylam concocted one of the most enjoyably idiosyncratic of all the Olympics Films I have so far watched, 1977’s “White Rock”, recounting, sort of, the 1976 Innsbruck Winter Olympics by improbably filtering something akin to an instructional video through a delirious, spacey 70s prism, epitomized in Rick Wakeman’s synthy score and James Coburn’s operatic narrator, where he takes everything so seriously that it becomes nigh comical. The film may or may not work for you, but it has distinct personality. “Olympic Spirit”, on the other hand, the official Olympic Film for the 1980 Lake Placid Winter Games, which Maylam co-directed with Drummond Challis, is much less distinct. Perhaps this can be attributed to Coca-Cola®, which produced the film, and which perhaps in its Brand First idea of culture sought to limit freedom of artistic expression. Then again, while blaming the brand and asking questions later is generally a wise policy, Coca-Cola® itself has concocted some stellar ad spots, from Mean Joe Greene to the Polar Bears, even if the latter puts the wrong idea in the heads of kids. Yet “Olympic Spirit”, despite having, like, you know, the freaking Olympic Games as its backdrop, has none of that Polar Bear ebullience. It, to quote Marge Gunderson, is a real shame. Running a few minutes shy of a half-hour, “Olympic Spirit” never really has the time to become a genuine record of Lake Placid account, like the epochal Bud Greenspan films. Perhaps that was in keeping with the spirit of the time. When “Olympic Spirit” would have been made, America was on the cusp of the music video revolution, with MTV and “Video Killed the Radio Star” a year away. Challis and Maylam’s film sort of suggests that future by making a montage of several music videos, spending a little time with a few sports from Lake Placid, forgoing any kind of specifics and mostly just reveling in a melodically enhanced whoosh of images. “13 Days in France” did that too for the 1968 Grenoble Games and it was nothing less than a masterpiece. But then, its director, Claude Lelouch, had a better sense of how to not only extract poetry from his images but to piece them together in such a way, with musical add-ons, to evince a clear vision, like All-American Peggy Fleming being recast as a French New Wave ingenue. In “Olympic Spirit”, on the other hand, speed skater Eric Heiden is just, well, a guy skating speedily in circles. A shot of the ski jumping hills at dawn from a distance elicits an agreeable sense of majesty but little profundity, and few other images generate any profundity either. 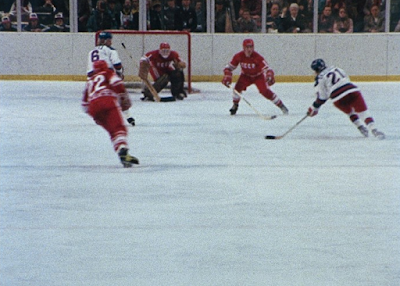 The only profound moment, oddly enough, is the one you would think already so well chronicled and celebrated that no further profundity could ever be found – that is, the Miracle on Ice, Team USA stunning the vaunted Soviet Union in ice hockey. Here, for the only time in “Olympic Spirit”, the music falls away, leaving only the sounds of the game and of the crowd, seen from angles suggesting a spectator’s perspective. It strips away the pomp of projects like “Miracle” and makes it feel more gut-level and of the moment, not a neatly told fairytale but a bundle of almost zany happenings erupting into a joyful human mass that requires no aesthetic emphasis to feel.